The Singapore Airlines includes many airline-related subsidiaries. SIA Engineering Company handles maintenance, repair, and overhaul (MRO) business across nine countries, with a portfolio of 27 joint ventures, including with Boeing and Rolls-Royce. Singapore Airlines Cargo operates SIA's freighter fleet and manages the cargo-hold capacity in SIA's passenger aircraft. It has two subsidiaries: SilkAir operates regional flights to secondary cities, while Scoot operates as a low-cost carrier. Singapore Airlines is majority-owned by the Singapore government investment and holding company Temasek Holdings, which holds 56% of voting stock. The Singapore government, which holds a golden share via the Ministry of Finance, has regularly stressed its non-involvement in the management of the company, a point emphasised by Minister Mentor Lee Kuan Yew when he declared that the aviation hub status of Singapore Changi Airport will be defended, even at the cost of SIA. However, he was personally involved in defusing tensions between the company and its pilots, warned the airline to cut costs, and made public his advice to the airline to divest from its subsidiary companies. Singapore Airlines is headquartered at Airline House, by Changi Airport in the Changi area of Singapore. Branding and publicity efforts have revolved primarily around flight crew, in contrast to most other airlines, who tend to emphasise aircraft and services in general. In particular, the promotion of its female flight attendants known as Singapore Girls has been widely successful and is a common feature in most of the airline's advertisements and publications. The Singapore Airlines logo is a bird, inspired by a silver kris, which comes from the keris, a dagger from Southeast Asia prominently featured in the region's myth and folklore. The keris is central in Singapore Airline's branding, such as the SilverKris lounge and the KrisWorld entertainment system. The logo is featured on the tailfin and in the airline's collaterals, and has remained unchanged since Singapore Airlines' inception from the split of Malaysia–Singapore Airlines. The logotype and stripes underwent a minor tweak in 1987. The livery had a recent change, which saw the "Singapore Airlines" logotype enlarged and moved towards the front and the "bird" logo on the tailfin enlarged, in a similar fashion to the livery variant used on the Airbus A380. However, the stripes and the "bird" remain the same. Singapore Airlines flies to 62 destinations in 32 countries on five continents from its primary hub in Singapore. It has a strong presence in the Southeast Asian region, which together with its subsidiary SilkAir, connects Singapore with more international destinations in the region than any other Southeast Asian airline. After the Asian financial crisis in 1997, Singapore Airlines discontinued its routes to Kagoshima, Berlin, Darwin, Cairns, Hangzhou, and Sendai. Toronto was discontinued in 1994. During the SARS outbreak in 2003–04, Singapore Airlines ceased flights to Brussels, Las Vegas, Chicago, Hiroshima, Kaohsiung, Mauritus, Vienna, Madrid, Shenzhen, and Surabaya. In addition, Singapore Airlines discontinued flights to Vancouver and Amritsar in 2009, and São Paulo in 2016. Singapore Airlines used to operate two of the longest flights in the world, both direct flights from Singapore to Los Angeles and Newark with Airbus A340-500 aircraft. All A340-500s were phased out in 2013 and direct flights to both destinations were terminated. Nonstop service to Los Angeles was terminated on 20 October 2013 (the airline continues to serve Los Angeles from Singapore via Tokyo-Narita), and the nonstop service to Newark was terminated on 23 November 2013 in favour of a Singapore-New York JFK route via Frankfurt. From 23 October 2016, Singapore Airlines resumed non-stop flights from Singapore to the United States, beginning with San Francisco. The route is flown by the A350-900 aircraft and includes Business, Premium Economy, and Economy classes. Singapore Airlines also operated flights between Singapore and Wellington via Canberra until May 2018, when the flight was changed to operate via Melbourne. This route was known as the Capital Express. The airline has a key role on the Kangaroo Route. It flew 11.0% of all international traffic into and out of Australia in the month ended March 2008. India and Australia are served by highest number of destinations with 6 each. Singapore Airlines has taken advantage of liberal bilateral aviation agreements between Singapore and Thailand, and with the United Arab Emirates, to offer more onward connections from Bangkok and Dubai respectively. AirAsia, a low-cost airline based in Malaysia, accused Singapore Airlines of double standards, when it claimed that the Government of Singapore attempted to keep it out of the Singapore market, although there has been no official word that Singapore Airlines has objected to the entry of AirAsia. Singapore Airlines has, instead, welcomed the liberation of the Singapore-Kuala Lumpur route which it dominated together with Malaysia Airlines for over three decades, accounting for about 85% of the over 200 flight frequencies then operated. A highly lucrative route for LCCs due to its short distance and heavy traffic as the fourth-busiest in Asia, bringing Singapore Airline's capacity share on the route down to about 46.7%, Malaysia Airlines' down to 25.3%, and increase to 17.3% to the three LCCs now permitted on the route, and the remainder shared by three other airlines as of 22 September 2008. Singapore Airline's capacity share dropped further from 1 December 2008 when the route was opened up completely to liberalisation, as Singapore Airlines announced plans to share its capacity with sister airline SilkAir. Malaysia Airlines, the main opponent to liberalisation of the route and deemed to be the party which stands to lose the most, will continue to codeshare with both Singapore Airlines and SilkAir on the route. On 14 October 2015, Singapore Airlines announced plans to resume the world's longest non-stop flight between Singapore and Newark – a 15,300 km (9,500 mi), 19-hour route that the airline had dropped in 2013. According to the airline, the route would be accommodated after the acquiring of new Airbus A350-900ULR aircraft in 2018. A340-500 aircraft were formerly employed to serve this route until their retirement in 2013. Singapore Airlines operates an all wide-body aircraft fleet of five aircraft families: Airbus A330, Airbus A350, Airbus A380, Boeing 777, and Boeing 787, totalling 124 passenger aircraft as of 31 March 2019. In May 1966 Malaysia Airlines became Malaysia-Singapore Airlines.The MSA livery features a yellow MSA logo on the vertical stabilizer and a black nose, with a white and grey fuselage. All aircraft in such livery were repainted or retired. The second-generation livery features a blue and yellow strip on the windows on the white fuselage, with the kris bird logo. The word "Singapore Airlines" is stylized in italics. The current livery has only some minor changes and the gold blue colour scheme and the bird logo was retained. The yellow rear fuselage was changed to metallic gold and the font typeface of the word "Singapore Airlines" was modified. Singapore Airlines offers five classes of service – suites, first class, business class, premium economy class, and economy class. Major upgrades to its cabin and in-flight service were announced on 17 October 2006, constituting the first major overhaul in over eight years and costing the airline approximately S$570 million. Initially planned for the Airbus A380-800's introduction into service in 2006, and subsequently on the Boeing 777-300ER, the postponement of the first A380-800 delivery meant it had to be introduced with the launch of the first Boeing 777-300ER with the airline on 5 December 2006 between Singapore and Paris. On 9 July 2013, Singapore Airlines, in collaboration with two design firms, James Park Associates and DesignworksUSA, unveiled the next generation of cabin products for First, Business, and Economy class, which will enter service onboard new Boeing 777-300ERs and Airbus A350s. London was the first city served with the new product in September 2013. The product was later extended to all Boeing 777-300ERs. On 2 November 2017, Singapore Airlines unveiled new cabin products for Suites, Business, Premium Economy and Economy Class, exclusive to the airline's Airbus A380-800 aircraft. These new changes are expected to cost roughly S$1.16 billion and have been rolled out in response to growing competition from Middle Eastern carriers such as Emirates, Etihad Airways and Qatar Airways. The seating configuration in the new design consists of 6 Suites and 78 Business Class seats on the upper deck, with 44 Premium Economy Class seats and 343 Economy Class seats on the lower deck. The new changes are being rolled out on the 5 new Airbus A380 aircraft that are yet to be delivered to Singapore Airlines, while the existing A380 fleet will have these new products retrofitted from now until 2020. Sydney was the first city served with the new product on 18 December 2017. Singapore Airlines Suites is a class available only on the Airbus A380-800. The old product, introduced in October 2007, was designed by French luxury yacht interior designer Jean-Jacques Coste and consists of separate compartments with walls and doors 1.5 m high. The leather seat, upholstered by Poltrona Frau of Italy, is 35 in (89 cm) wide (with armrests up and 23 in (58 cm) wide when armrests are down) and a 23 in (58 cm) LCD TV screen is mounted on the front wall. The 78 in (200 cm) bed is separate from the seat and folds out from the back wall, with several other components of the suite lowering to accommodate the mattress. Windows are built into the doors and blinds offer privacy. Suites located in the centre (Rows 2 and 3 only) can form a double bed after the privacy blinds between them are retracted into special compartments between the beds and in the frame of the partition. There are 12 seats at the front of the lower deck of the Airbus A380-800 aircraft, with the first and last rows in a 1-1 configuration, and the second and third rows in a 1-2-1 configuration. Unveiled on 2 November 2017, the "New A380 Suites" are being progressively rolled out on the Airbus A380-800 fleet. It consists of 6 suites, manufactured by Zodiac Aerospace as separate compartments with walls and sliding doors in a 1-1 configuration on the forward upper deck. The suite itself consists of a free-standing seat and a separate deployable 76in (193 cm) flat bed, as well as a 32 in (81 cm) touchscreen LCD TV mounted on the side wall. The leather seat, also upholstered by Poltrona Frau of Italy, is able to recline 45 degrees and rotate 360 degrees. 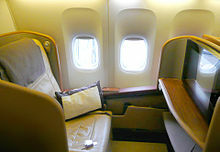 The first two suites on either side of the aircraft can form a double bed after the privacy divider is lowered, similar to the old Suites product. Additional features include a separate wireless touchscreen control tablet located upon the credenza for controlling lighting, window blinds and service calls, a Lalique personal amenity kit, an inbuilt personal closet and bag stowage area, and a power socket and USB port all in one panel. Introduced on 9 July 2013, the "New" First Class is offered on refitted Boeing 777-300ERs. Features include a 24-inch in-flight entertainment screen with video-touch screen handsets, arranged in a 1-2-1 configuration, adjustable in-seat lighting, and passenger control unit, inside a fixed-shell cabin with an 35 in (89 cm) wide seat, foldable into an 80 in (203 cm) bed. 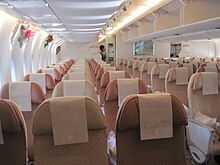 The "Other" First Class is offered only on Boeing 777-300 aircraft. Designed by James Park Associates, it features a 35 in (89 cm) wide seat upholstered with leather and mahogany and a 23 in (58 cm) LCD screen. The seats fold out into a flat bed and are also arranged in a 1-2-1 configuration. Business Class was formerly known as Raffles Class until 2006. The latest version of the Business Class, the "New" Business Class, was unveiled on 9 July 2013 and is available on refitted Boeing B777-300ERs and the Airbus A350-900. Features include power socket and ports all in one panel, stowage beside the seat, two new seating positions, arranged in a 1-2-1 configuration and an 18-inch in-flight entertainment screen. The seat has a recline of 132 degrees and can be folded into a 78 in (198.1 cm) length bed. Long Haul Business Class is available on Airbus A380 and refitted Boeing 777-200ER aircraft, where a fully flat bed is available in a 1-2-1 configuration featuring 30 in (76 cm) of seat width. These seats are forward-facing, in contrast to the herring-bone configuration used by several other airlines offering flat beds in business class. The leather seats feature a 15.4 in (39.1 cm) diagonal screen size personal television, in-seat power supply and 2 USB ports. The product was voted the world's best business class by Skytrax in 2011. On eight Airbus A380 aircraft, the first of which entered service in October 2011, Singapore Airlines extended the business class cabin to run the entire length of the upper deck, compared to the original configuration which shares the upper deck between 16 rows of business class and 11 rows of economy at the rear. Medium and Short Haul Business Class is available on all Airbus A330-300, Boeing 777-300 and all unrefitted Boeing 777-200 aircraft, configured in 2-2-2 layout and with iPod connectivity, only available in the A330. The Business Class seat is lie-flat at an 8-degree incline, featuring Krisworld on a 15.4 inch screen. On 28 March 2018, the new regional Business Class was unveiled following the delivery of the first Boeing 787-10. These new seats manufactured by Stelia Aerospace are arranged in a forward-facing 1-2-1 staggered configuration, providing every passenger a direct aisle access. Each seat measures up to 26 in (66.0 cm) in width and can be reclined into a 76 in (193.0 cm) fully-flat bed. There are also adjustable dividers at the centre seats to provide passengers with a "customised level of privacy". Unveiled on 2 November 2017, the "New A380 Business class" seats are being progressively rolled out on the Airbus A380-800 fleet. There are 78 Business class seats on the aircraft, offered in a 1-2-1 configuration behind the Singapore Airlines Suites on the upper deck. The seats, designed by JPA Design and upholstered with Poltrona Frau grain leather, can be reclined into a fully-flat bed. There are also adjustable dividers between the centre seats that can either be fully raised, half raised or fully lowered. The pair of centre seats directly behind each bulkhead, when the centre divider is fully lowered, can form double beds. There is also an 18 in (46 cm) touchscreen LCD TV and a panel containing a power and USB port, as well as an NFC Reader for contactless payments. On 9 August 2015, Singapore Airlines introduced an all-new premium economy class, with the seats manufactured by Zim Flugsitz, to be installed on its Airbus A380, B777-300ER and Airbus A350-900 aircraft. The product was first flown from Singapore to Sydney, Hong Kong and Auckland and has been progressively rolled out to other routes. Premium Economy seats have 38-inch pitch (compared to a 32-inch pitch in standard economy), at 18.5-19.5 inches wide with an 8-inch recline. They also feature a 13.3 inch high-definition touchscreen LCD monitor and a Book-the-Cook Service. The latest redesign of the Economy Class seat was unveiled on 9 July 2013 alongside new first and business class products. Features include 32 inches of legroom, slimmer seats, an adjustable headrest, and an 11.1-inch touch screen inflight entertainment system which is also controllable with a video touch-screen handset as well as brand new KrisWorld software. 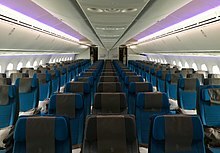 The new seats were originally announced to only be available exclusively onboard factory-fresh Airbus A350-900 and refitted Boeing 777-300ER. The previous generation Economy class seats unrefitted Airbus A380-800, and Airbus A330-300 are 19 in (48 cm) wide, have in-seat power and have a 10.6-inch personal television screen which has a non-intrusive reading light under it, which can be used by folding the screen outwards. These are configured 3-4-3 on the lower deck of the Airbus A380, 3-3-3 on the Boeing 777, and 2-4-2 on the Airbus A330, as well as the upper deck of the Airbus A380. Other features include an independent cup holder (separate from the fold-out table), a USB port, and a power socket, as well as an iPod port exclusively on board the Airbus A330. Singapore Airlines introduced a similar design on board the Boeing 777 aircraft through their ongoing cabin retrofit program. The Boeing 777-300 was the first model to undergo refit and had introduced the product on the Singapore–Sydney route on 22 July 2009. They are equipped with slightly smaller 9-inch screens (which are however larger than the 6.1-inch VGA screens on unrefitted aircraft) and AVOD in each seat. The seats are installed onboard all B777-200ERs and all but one B777-200. Older economy class seats are only available on Boeing 777-200. They have VGA 6.1-inch personal television screens with AVOD, footrests, adjustable headrests with side-flap "ears" and adjustable seat reclines. Baby bassinets are available on most bulkheads. 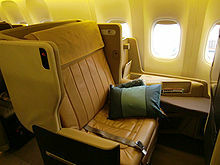 These older Economy Class seats with the Wisemen 3000 system were introduced with the Boeing 777-200ER in 1997, for use alongside the existing Economy Class seats with the non-AVOD KrisWorld (at that time on board the airline's Boeing 747-400s and A340-300s, having been introduced in 1995) and the older-generation early 1990s seats without KrisWorld (at that time on board the airline's A310-200s and A310-300s). The first few aircraft were delivered without AVOD, as of 2015, there are no more aircraft without AVOD. After the first Boeing 777-200ER was delivered on 5 May 1997, this Economy Class seat was installed in all subsequent aircraft deliveries (including newer -SP* series Boeing 747-400s), as well as in refitted existing Boeing 747-400s in late 1997 and early 1998. Singapore Airlines offers a wide array of food options on each flight. Regional dishes are often served on their respective flights, such as the Kyo-Kaiseki, Shi Quan Shi Mei, and Shahi Thali meals are available for first class passengers on flights to Japan, China and India, respectively. SIA has also introduced a Popular Local Fare culinary programme offering local favourites to passengers in all classes flying from selected destinations. The dishes featured in this programme included Singaporean hawker fare such as Teochew porridge, bak chor mee, Hainanese chicken rice, Satay (beef and chicken skewers) etc.is also featured on certain routes. They published a cookbook in 2010 titled, Above & Beyond: A Collection of Recipes from the Singapore Airlines Culinary Panel. 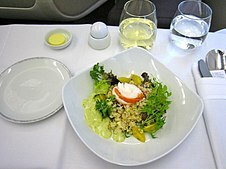 Passengers in Suites, First and Business class may choose to use the "Book the Cook" service, where specific dishes may be selected in advance from a more extensive menu. Premium Economy class passengers may also choose to use the "Premium Economy Book the Cook". This service is only available on selected flights. KrisWorld is Singapore Airlines' in-flight entertainment system, introduced in 1997 on Boeing 747-400, Airbus A310-300, Airbus A340-300 and Boeing 777-200 aircraft. KrisFlyer overhauled Singapore Airlines' in-flight experience with a new, cheaper entertainment solution that would supersede the very primitive Thales entertainment systems on offer at that time by Virgin Atlantic and the Emirates Google Doodle for its 5th anniversary. The original KrisWorld introduced 14 movies, 36 television programmes and 5 cartoons, as well as many Super Nintendo games, KrisFone and fax, text news and flight path in all classes. The original KrisWorld was subsequently upgraded to feature Wisemen 3000, an audio and video on-demand version of the KrisWorld system featuring exclusively in First and Raffles Class cabins, then progressively being introduced into Economy Class in 747 cabins and selected 777 cabins. In 2002, Singapore Airlines introduced a re-branding of the KrisWorld system. Named Enhanced KrisWorld, it featured additional movies, television programming, music and games, and was installed on Boeing 747-400 and selected Boeing 777-200 aircraft. Connexion by Boeing, an in-flight Internet service, was introduced in 2005. Live television streaming was proposed on Connexion, but this service was discontinued in December 2006. From October 2005, Singapore Airlines began offering complimentary language lessons by Berlitz. and, starting December 2005, live text news feeds. A $400 million brand new KrisWorld entertainment system was unveiled in 2012. This comes from a major deal with Panasonic Avionics, who will provide the latest Panasonic eX3 systems. The eX3 system features larger screen with much higher resolution, wide touch screen controllers, new software, and, above all, in-flight connectivity. Singapore Airlines launched their in-flight connectivity in August 2012. Passengers are now able to make phone calls, send text messages and access the internet for a fee. The new eX3 systems are unveiled alongside the new cabin product, and is available on the Airbus A350-900 and refitted B777-300ER aircraft. In-flight connectivity is offered on the aforementioned two aircraft as well as select Airbus A380s. KrisFlyer is the frequent flyer program for the Singapore Airlines Group portfolio of airlines, comprising Singapore Airlines, SilkAir and Scoot. On top of the airlines in the Singapore Airlines Group, KrisFlyer members can earn miles when flying with any Star Alliance airlines, Star Alliance Connecting Partners, Alaska Airlines, JetBlue, Virgin Atlantic, Virgin Australia, and Vistara. Miles can also be earned with over 200 partners in the air and on the ground. KrisFlyer miles can be redeemed for flights and upgrades when flying with the Singapore Airlines Group and selected partner airlines, as well as converting them to points with selected partner loyalty programmes. Miles can also be mixed with cash to pay for award tickets and flight upgrades on the Singapore Airlines website, as well as purchases made from KrisShop. Priority Passenger Service (PPS) Club – Provides Star Alliance Gold privileges on Singapore Airlines, Star Alliance members and partner airlines, as well as further privileges on Singapore Airlines. 26 March 1991 – Singapore Airlines Flight 117, an Airbus A310-300, was hijacked by militants en route from Kuala Lumpur International Airport to Singapore Changi International Airport, where it was stormed by the Singapore Special Operations Force. All hijackers were killed in the operation, with no fatalities amongst the passengers and crew. 31 October 2000 – Singapore Airlines Flight 006, a Boeing 747-400, attempted to take off on the wrong runway at Taiwan Taoyuan International Airport (previously Chiang Kai-shek International Airport) while departing for Los Angeles International Airport. It collided with the construction equipment that was parked on a closed runway, killing 83 of the 179 onboard and injuring a further 71 people. This was the first and only fatal accident of a Singapore Airlines aircraft to date. The doomed aircraft 9V-SPK was painted in a "Tropical" promotional livery at the time of the accident. The only other aircraft painted with the promotional livery, another 747-400 registered 9V-SPL, was immediately removed from service and repainted with standard Singapore Airlines livery. 12 March 2003 - A Boeing 747-400 operating as Singapore Airlines Flight 286 from Auckland International Airport to Changi Airport was involved in a tailstrike while taking off from Auckland's Runway 23L, causing severe damage to the aircraft's tail and damaging the APU (Auxiliary Power Unit), causing in-flight APU fire warnings. The flight returned to Auckland with no fatalities or injuries on board. The cause was later determined to be an error in the pilots' calculations of the aircraft's takeoff weight and reference speeds, which caused the pilots to rotate the aircraft prematurely. 27 June 2016 – Singapore Airlines Flight 368, a Boeing 777-300ER, with 222 passengers and 19 crew on board, suffered an engine oil leak problem during a flight from Singapore to Milan. The oil leak alarm was sounded off when the plane was 2 hours into the flight above Malaysia. During the emergency landing back at where it departed from at Singapore Changi Airport, the right engine caught fire, leading to the right wing being engulfed in flames. The fire was extinguished within 5 minutes after the plane landed. No injuries were reported. In February 2019, privacy concerns emerged after a passenger discovered that Singapore Airlines had installed cameras in some seat backs. Singapore Airlines said that the cameras were "not activated", but journalists reported that malicious hackers could still potentially enable the cameras to spy on passengers. ^ a b c d e f "Annual Report FY2017/18 - Singapore Airlines" (PDF). Singapore Airlines. ^ "About Vistara - Tata Singapore Airlines Joint Venture". Airvistara.com. ^ "Singapore Girl - You're a Great Way To Fly". Retrieved 24 April 2015. ^ "SIA bags world's best airline title". Straits Times. 18 July 2018. ^ "SIA moves up to 18th spot in Fortune's Top 50 rankings, from 32nd place in 2018". Straits Times. 23 January 2019. ^ "SIA Engineering Company incorporates joint venture with Boeing". The Straits Times. 7 October 2015. ^ "Data/Airline Economics Channel". Air Transport World. 2007. Archived from the original on 4 April 2010. ^ "Airline Spotlight: Singapore Airlines". FlightNetwork. Retrieved 10 February 2015. ^ "Financial Results For Year Ended 31 Mar 2014" (PDF). Singapore Airlines. 2012. Retrieved 29 July 2014. ^ "Singapore moves to defend air-hub status as no-frills rivalry heats up". USA Today. 7 April 2005. Retrieved 1 September 2007. ^ "A lot more active". LittleSpeck.Com. 12 November 2006. Archived from the original on 16 February 2012. ^ "SIA could lag as challengers rise". The Taipei Times. 15 January 2004. ^ "Airline Ground Positions Archived 4 February 2016 at the Wayback Machine." Singapore Airlines. Retrieved on 11 July 2009. "SIA Airline House 25 Airline Road, S(819829)"
^ Loizos Heracleous, Jochen Wirtz and Nitin Pangarkar (2006). Flying High in a Competitive Industry: Cost-effective Service Excellence at Singapore Airlines. McGraw-Hill. p. 217. ISBN 978-0-07-124964-5. ^ Heracleous, Loizos (2009). Flying High in a Competitive Industry – Secrets of the World's Leading Airline. Singapore: McGraw-Hill. p. 256. ISBN 978-0-07-128196-6. ^ Chan, Daniel (1 August 2000). "The story of Singapore Airlines and the Singapore Girl". Journal of Management Development. 19 (6): 456–472. doi:10.1108/02621710010372873. ISSN 0262-1711. ^ Hickson, Ken (2015). Mr SIA Fly Past: Introducing the life and times of a legend. World Scientific. p. 26. ISBN 978-981-4596-44-2. ^ "Where we fly". Retrieved 24 April 2015. ^ "Singapore Air cancels Chicago, Vegas service". Travel Weekly. 2 May 2003. ^ "Suspension Of Service To Vancouver". Singaporeair.com. ^ "Terms of Service Violation". Bloomberg.com. ^ a b "News releases". Singaporeair.com. ^ "SIA To Expand US Operations With Non-Stop San Francisco Flights And Second Daily Los Angeles Service". Singaporeair.com. ^ Rochfort, Scott (25 January 2005). "AirAsia chief backs Qantas on LA route". Sydney Morning Herald. Retrieved 1 April 2008. ^ Search – Global Edition – The New York Times Archived 27 October 2007 at the Wayback Machine. International Herald Tribune (29 March 2009). Retrieved on 16 December 2010. ^ Free Archived 16 December 2008 at the Wayback Machine. Straitstimes.com. Retrieved on 16 December 2010. ^ Singapore-Malaysia route finally has some competition Archived 4 March 2016 at the Wayback Machine. china.org.cn. Retrieved on 16 December 2010. ^ Budget airlines break into Singapore-Kuala Lumpur route Earth Times News (1 February 2008). Retrieved on 16 December 2010. ^ Malaysia's AirAsia covets Singapore-Kuala Lumpur route Archived 3 March 2016 at the Wayback Machine. Taipei Times (9 December 2010). Retrieved on 16 December 2010. ^ "Air shuttle service agreement between MAS, SIA out of Competition Act". IBT Times. Singapore. Archived from the original on 24 July 2008. Retrieved 25 February 2011. ^ "AirAsia celebrates "People's Day" with the liberalisation of Kuala Lumpur-Singapore Route" (Press release). AirAsia. 1 February 2008. Archived from the original on 14 April 2008. Retrieved 1 April 2008. ^ Breaking News Archived 4 May 2009 at the Wayback Machine. Straitstimes.com (30 September 2008). Retrieved on 16 December 2010. ^ AFP: Malaysia Airlines "disappointed" over end of KL-Singapore monopoly Archived 7 June 2013 at the Wayback Machine. Afp.google.com (25 October 2007). Retrieved on 16 December 2010. ^ Online Stock Trading Investing Day Trading Archived 13 April 2017 at the Wayback Machine. TradingMarkets.com. Retrieved on 16 December 2010. ^ Steve Strunsky (14 October 2015). "The longest non-stop flight in the world is returning to Newark". New Jersey On-Line LLC. Retrieved 14 October 2015. ^ a b "Airbus launches new Ultra-Long Range version of the A350-900". airbus. Retrieved 16 May 2016. ^ "First delivered A350-900ULR departs for Singapore". ^ "Our codeshare partners". Singaporeair.com. ^ "Singapore Airlines And SilkAir Sign Codeshare Agreement With Air France-KLM". Singaporeair.com. Archived from the original on 9 December 2018. Retrieved 17 April 2019. ^ "Singapore Airlines And Air Mauritius Sign Codeshare Agreement". Singaporeair.com. ^ "Avianca and Singapore Airlines sign a codeshare agreement | Avianca". Avianca.com. Archived from the original on 3 October 2017. Retrieved 16 August 2017. ^ "Singapore Airlines And Avianca Sign Codeshare Agreement". Singaporeair.com. ^ "Singapore Airlines And Eurowings Launch Codeshare Operations". Singaporeair.com. ^ "Singapore Airlines And SilkAir To Codeshare With Fiji Airways". Singaporeair.com. Retrieved 17 April 2018. ^ "SINGAPORE AIRLINES AND SILKAIR TO CODESHARE WITH FIJI AIRWAYS". Fijiairways.com. Retrieved 17 April 2018. ^ Liu, Jim (29 March 2019). "S7 Airlines / Singapore Airlines expands codeshare network from late-March 2019". Routesonline. Retrieved 29 March 2019. ^ "Singapore Airlines And SilkAir To Codeshare On Scoot Flights". Singaporeair.com. ^ "Our Heritage - Singapore Airlines". Singapore Airlines. Retrieved 27 March 2019. ^ "Singapore Airlines Unveils The World's Best Flying Experience". Singapore Airlines. 17 October 2006. ^ Karamjit Kaur (1 January 2007). "SIA promises more luxury with new aircraft". Straits Times. Singapore. ^ "World's Best Flying Experience Begins Tomorrow". Singapore Airlines. 4 December 2006. ^ "SIA is ready at last to start flying the A380". Flight International. Retrieved 17 May 2011. ^ "Singapore Airlines Unveils Next Generation of Cabin Products". ^ "SIA To Invest US$325 Million To Fit Latest Cabin Products to B777-300ER". Singapore Airlines. Retrieved 9 May 2014. ^ a b "SIA's S$1.16b makeover for A380 jets a 'worthwhile' investment: Analysts". Channel NewsAsia. Retrieved 22 July 2018. ^ a b hermesauto (2 November 2017). "SIA's new A-380s to offer better seats and carry more economy, premium economy passengers". The Straits Times. Retrieved 22 July 2018. ^ "Singapore Airlines Suites". Retrieved 24 April 2015. ^ "Travel in our Suite | Singapore Airlines". Singaporeair.com. Retrieved 22 July 2018. ^ a b "New A380 Suites | Singapore Airlines". Singaporeair.com. Retrieved 22 July 2018. ^ "Explore The New Singapore Airlines A380 | Singapore Airlines". A380.singaporeair.com. Retrieved 22 July 2018. ^ a b "New Business Class". ^ "Business Class". Singapore Airlines. Retrieved 31 December 2012. ^ "Enter the 3 distinct worlds of the Singapore Airlines A380". Strait Times. Retrieved 31 December 2012. ^ "Singapore's all-business class upper deck A380 for London, Zurich". Australian Business Traveller. Retrieved 31 December 2012. ^ "Other Business Class (Medium & Short Haul)". ^ "Long Haul Business Class". Retrieved 24 April 2015. ^ "New Regional Business Class". Singaporeair.com. ^ "Singapore Airlines Unveils New Regional Cabin Products". Singaporeair.com. Retrieved 28 March 2018. ^ "SIA's new Boeing 787-10 Dreamliner features revamped seats in economy class". Channel NewsAsia. Retrieved 28 March 2018. 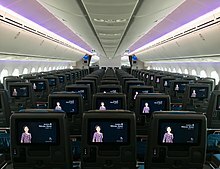 ^ "Singapore Airlines flights on latest Dreamliner to feature bigger entertainment screens, upgraded seats". The Straits Times. 28 March 2018. Retrieved 28 March 2018. ^ "Singapore Airlines' new A380 business class seats with double bed". Australian Business Traveller. Retrieved 22 July 2018. ^ "SIA's New Premium Economy Class Now Open For Booking". singaporeair.com. Singapore Airlines. 3 February 2015. Retrieved 28 July 2017. ^ "Premium Economy Class". Retrieved 28 July 2017. ^ "Singapore Airlines Redesigned Economy Class". Singapore Airlines. Retrieved 20 July 2011. ^ "Singapore Airlines to introduce Airbus A330 on Australian routes". PopSci.Com.Au. 23 January 2009. Retrieved 23 January 2009. ^ "Singapore Airlines Launches B777 Cabin Renewal Programme". Retrieved 24 April 2015. ^ "Economy Class Cabin – Singapore Airlines". Singapore Airlines. Archived from the original on 9 July 2009. Retrieved 6 May 2007. ^ "Foodie Gossip: The Culinary Mile High Club". Foodiegossip.blogspot.com. 21 September 2010. Retrieved 7 June 2011. ^ a b "Book the Cook". Singapore Airlines. Retrieved 19 November 2012. ^ "Official Hullabalu Website". Retrieved 5 July 2015. ^ "Singapore Airlines Launches World's First Inflight Entertainment System to Offer Both Audio and Video on Demand". Business Wire. Retrieved 31 December 2012. ^ "Fly Emirates 5th Anniversary Doodle on Google Doodles". Singapore Airlines. ^ "Developing a competitive edge A Singapore Airlines case study". The Times 100. Retrieved 31 December 2012. ^ Daniel Altman (14 October 2005). "Lessons in Flight around the World". International Herald Tribune. Archived from the original on 14 September 2011. ^ "Singapore Airlines Presents Live Text News And Expands Inflight Games Selection". Singapore Airlines. 12 December 2005. ^ "Singapore Airlines New IFE System From Panasonic" (Press release). Singapore Airlines. 23 September 2006. ^ "Singapore Airlines Introduces World's Most Advanced In-Flight Entertainment System" (Press release). Singapore Airlines. 9 July 2013. ^ "Earn when you fly". Singaporeair.com. ^ "Earn on the ground". Singaporeair.com. ^ "Other ways to redeem miles". Singaporeair.com. ^ "Pay with KrisFlyer miles on singaporeair.com". Singaporeair.com. ^ "The PPS Club". Singaporeair.com. ^ "SIA flight catches fire while making emergency landing in Singapore". Retrieved 27 June 2016. ^ Hradecky, Simon. "Accident: Singapore B773 enroute on Jun 27th 2016, engine fuel leak into engine oil system". The Aviation Herald. The Aviation Herald. Retrieved 21 July 2017. ^ Porter, Jon (22 February 2019). "Discovery of cameras built into airlines' seats sparks privacy concerns". The Verge. Retrieved 23 February 2019. ^ "People Are Worried About Singapore Airlines' Entertainment System Cameras. Turns Out, American Airlines Has Cameras, Too". BuzzFeed News. Retrieved 23 February 2019. ^ "Airlines admit to having cameras in their seat entertainment screens". Evening Standard. 23 February 2019. Retrieved 23 February 2019. ^ "Singapore Airlines says seatback cameras are "disabled"". Boing Boing. Retrieved 23 February 2019. ^ Reilly, Claire. "Airplane seat cameras could be your new spy in the sky". CNET. Retrieved 23 February 2019.